For teachers, readers, and writers of poetry...that they are there. This poem...it speaks to me. I copied it, by hand, into my little poetry notebook yesterday. And it was a struggle. Not because it was hard to use good penmanship, but rather because it stirs up so many emotions. Leaving a year behind is often celebrated. Resolutions and confetti stuffed down our throats and thrown in our faces. There is so much more to it than that. I have a friend. Well, she's more than a friend. And she recently moved away. Far away. I came within an angstrom of giving her this as a going away present. But I chickened out. I give it to you, instead, with hopes that it finds its way to her. May your burnings be bright. And what's left after the blaze be your charge into a new year. I must say, it's been an amazing summer. For many reasons. Chief amongst them, probably the fact that I've spent so many great moments with my children. I don't reflect too often on the metaphysical aspects of parenthood. What am I leaving them with? What will they remember? Just keep them happy, make memories, and teach them to be good people...those are my tenets, I suppose. And I'm ok with that. Read the rest of the poem (the ending's worth it!!!) at The Writer's Almanac. If you like it as much as I do, you'll probably find yourself reading it several times. Glad to make a return to Poetry Friday, which today is being rounded up at A Year of Reading. Check out all the other amazing posts being shared there today. So, for reasons too numerous to list right now, I'm making some very strong efforts toward discovering happiness in life. They're going exceptionally well but, like anything in the realm of self-improvement, only time will tell. I've got plenty of cause to feel confident, though. One thing I'm attempting to do is bring things into my life that make me happy. Poetry has always been one of these things, so it's making a return to my life rather than a debut. It's amazing how turning to poetry can help one navigate pretty much any emotion in existence. Whether it's coping with loss, celebrating a birth, or the happiness and joys of every day life. There's a poem out there for it all. As I find myself excited by the possibilities that life has to offer for the first time in a long time, I want to share a poem that brought me happiness today. 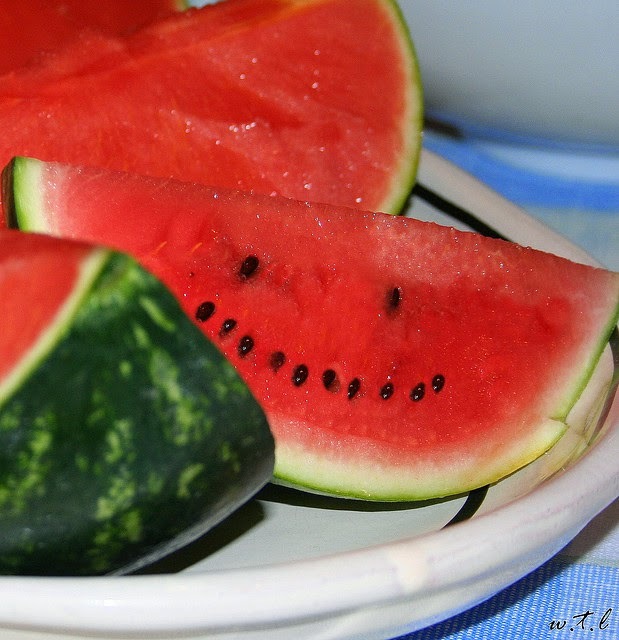 "Reflections on a Gift of Watermelon Pickle Received from a Friend Called Felicity"
Does this make you happy, too? Something about the innocence and nostalgia. Or the imagery. Or the idea of preserving our youth. And it has a sweet ending, which you know I love. It also reminds me of one of my other all-time-favorites by Gary Soto. I apologize for publishing this poem in its entirety. I try to be a responsible digital citizen when it comes to copyright. May the poetry gods absolve me of this sin. So here's to happiness. And poetry. And life. I'll be back soon with more to share. I'm amazed at the ways poets can describe things. And I love finding poets I've never heard of. I had a poem stashed in my email that fits both of these and I rediscovered it today. so that women moaned syllables back in return. Please check out the rest of this gem at Poets.org. And definitely check out the Poetry Friday round-up at Mainely Write. I need to get back to blogging here. My lay-off needs to end. I think I can do it. I'll start with today. Nobody will stop you from creating. Do it tonight. Do it tomorrow. That is the way to make your soul grow - whether there is a market for it or not! The kick of creation is the act of creating, not anything that happens afterward. I would tell all of you watching this screen: Before you go to bed, write a four line poem. Make it as good as you can. Don't show it to anybody. Put it where nobody will find it. And you will discover that you have your reward. Read the rest of the poem here. And check out the Poetry Friday roundup at Anastasia's poetry blog. Confession time: I just got my first smartphone. Welcome to the 21st Century, right? Yes, it was about time. And yes, it didn't take me long to realize how very, very sweet having a smartphone is. Definitely embarrassed to admit how much I love it. 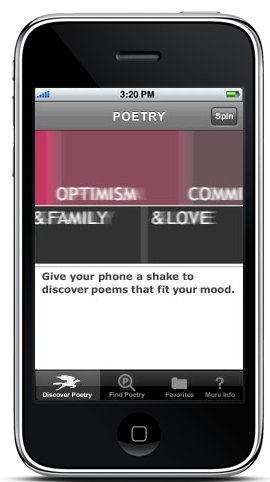 One of the first apps I downloaded was from The Poetry Foundation, a great app with two "wheels" to "spin". The wheels are marked with categories: humor, joy, compassion, youth, etc. The wheels match up to create a list of poems that match the combination: Poems about Humor and Youth, Love and Joy, etc. Brilliant! You can also search for poems by poet, poem title, subject, and mood. AND you can star your favorites for future reference. Also brilliant. If you're a smartphone user and a poetry lover, you've got to get this. Oh, and did I mention that it's free!?!? Again...brilliant. Check out how to get the Poetry Foundation Mobile app for your smartphone or tablet by clicking here. And be sure to check out this week's Poetry Friday roundup at No Water River, a pretty nifty blog that I'm going to have to start following. Sometimes, you need a plan. You've gotta think about things before you do them. Figure out what to do first, next, and last. Obsess over the details. Try to get it all right. Set yourself up to ensure success. Whether it's a lesson you're teaching, a vacation you're planning, or figuring out how to ask somebody out. Sometimes you need a plan. And then there's those other times. The times when you just have to go for it and say "forget about a plan." I'd love to be more like the latter, but I have to admit that it's the former that tends to describe my M.O. most of the time. What's my point? Not sure. But today I'm picking the first poem I see to share with you. Rebellious, I know. But you have to start somewhere. So here's the first one I found when I did some poetry hunting today, and it's by a poet I'm not all familiar with beyond the name, Willa Cather. When once we are alone, and shut the door ? The arms of Darkness hold me at the last. I kiss the lips of Silence in the end. I come again unto the breast of Night. That she will stay, though all the rest may go. Read the rest of this poem here. Not the most uplifting choice, but it's beautifully written, and that brings me joy. I wonder how long it took to write it. How much planning and thought went into it? How many drafts? 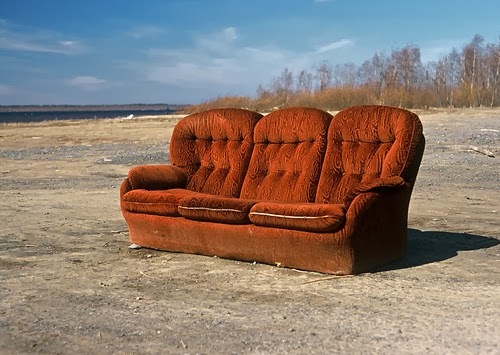 Does great poetry ever come from the hip? Maybe in the early stages, when the idea first forms? Maybe someday I'll figure it out. Until then, be sure to enjoy the rest of the Poetry Friday offerings courtesy of today's host Read, Write, Howl. 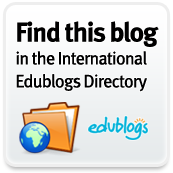 An awesome resource for awesome schools. The Small Nouns by B. Curran is licensed under a Creative Commons Attribution-NonCommercial-NoDerivs 3.0 Unported License.